Lynn's worries, of course, were unnecessary. After Lynn — who was notoriously tight with a buck — placed a small ad in the Washington Post about a month before performance, it sold out in about a week. The priciest tickets were just $4, about $30 in today's dollars. On the morning of February 11, the Beatles — who were coming off a sensational nationally-televised performance on The Ed Sullivan Show two days before — boarded a train in New York and rode south to Washington. (A snowstorm led them to change their original plan to fly in to National Airport.) As Washington Post journalist Jerry Doolittle reported at the time, the group traveled in style, in an old Richmond, Fredericksburg and Potomac sleeper car named the King George. They were accompanied by filmmakers Albert and David Maysles, whose employer, British independent TV production company Granada, had convinced Beatles manager Brian Epstein to let them make an intimate documentary of the group's U.S. visit. Some of the footage shot by the Maysles shows John Lennon roaming the train's hallway, and Ringo Starr and Paul McCartney good-naturedly chatting with the children of the train's other passengers. At 3:09 p.m., about 20 minutes behind schedule, the King George rolled to a stop inside Union Station. District police inspector John S. Hughes stepped inside to usher the Beatles off the train. "It's great being here in New York!" Ringo quipped, feigning confusion as he emerged. Undoubtedly to the Beatles' surprise, the platform contained only a cadre of reporters and a quartet of teens recruited by WWDC to hold a welcome banner. Police, wary of the sort of creaming mob that the Beatles attracted at New York's LaGuardia airport, had cordoned off the gate. They'd ignored the pleas of 2,000 or so fans who'd been waiting for the group, and herded them out to the concourse. ("You can't throw her out," one girl reportedly moaned to police as they pushed back her friend. "She's the president of the Beatles Fan Club.") Nevertheless, when the Beatles' youthful devotees spotted the train, they led out what Doolittle described as "the gold-plated, all-wool, guaranteed shriek of the adolater." The crowd pressed in, and teenagers formed "a twisting, hopping frieze of adulation" around the group as promoter Lynn guided them into limousines that ferried them to the Coliseum, about three blocks away, to do the setup and sound check for the evening show. After the sound check, the group posed for this picture with the U.S. Capitol in the background, and then went to the Shoreham Hotel on Connecticut Avenue NW, where the entire seventh floor had been booked to give them some privacy. Lennon reportedly scribbled the evening's song list on hotel stationery. Then it was back to the Coliseum, for a press conference with the local news media and radio DJs. Doolittle wrote that the Beatles "conducted themselves with an aplomb that bordered on total relaxation." When asked if any of the group's members had formal musical training, for example, Lennon playfully reposted, "You're joking!" 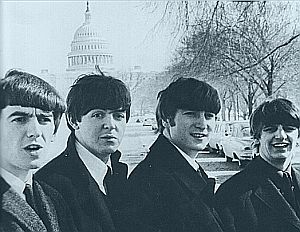 They also had a brief conversation with Marsha Albert, a teenage girl from Silver Spring who had written to WWDC DJ Carroll James and urged him to play the Fab Four's record in December 1963, after she heard a snippet of it in an Walter Cronkite segment on Beatlemania in Great Britain. In addition to the scheduled opening acts, Jay and the Americans and the Righteous Brothers were added to the bill. But each act was limited to just two numbers. As Roe recalled in a 2010 Washington Post article: "The marquee didn’t say anything about the other acts. It just said 'The Beatles.' It was all about them. But I wasn’t offended. That’s just the way it worked. I was there to do my two songs and then get off the stage." At a little past 8:30 p.m., the Beatles took the stage. We'll give you more on their performance in an upcoming post. Who says you can't turn back time? 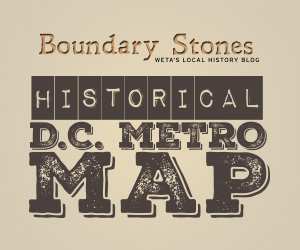 That's exactly what the DC Preservation League and Douglas Development did on February 11 to celebrate the Beatles. In 1968, impoverished Americans flocked to DC to live out MLK's final dream: economic equality for all. Prior to DC United's success in the mid-1990s, the District endured a string of ill-starred pro soccer franchises, including the Washington Diplomats.